It'll be awesome if they find spectroscopic evidence for life beyond Earth, we'll just have to wait and see. The Transiting Exoplanet Survey Satellite (TESS) program certainly sounds ambitious. Checking the brightest stars in Earth's sky for planets. Two year program, supposed to review 200,000 star systems. Hopefully we can send a probe to study it in detail. My inner Mulder wants to believe, but my inner Scully remains skeptical. Maybe not blue skies on Mars. But patches of blue firma are found in enhanced photos. Mars is often referred to as the Red Planet, but pictures from one of NASA’s orbiters showed what appeared to be a striking blue sand dune. Not so great for USA viewers, but Africa & Asia should have a great Lunar Eclipse show this coming Friday. Total Lunar Eclipse - July 27–28, 2018. Sounds like a good day to park your plane. Air Force remains silent after huge meteor hits near US military base. A meteor hit the earth and exploded with 2.1 kilotons of force last month, but the US Air Force has made no mention of the event. NASA’s Jet Propulsion Laboratory confirmed an object of unspecified size travelling at 24.4 kilometres per second struck earth in Greenland, just 43 kilometres north of an early missile warning Thule Air Base on the 25th of July, 2018. The NASA "InSight" lander has touched down safely on MARS. November 2018. NASA’s spacecraft that landed on Mars Monday has beamed back its first clear photo of the desolate Red Planet. “There’s a quiet beauty here. Looking forward to exploring my new home,” NASA tweeted late Monday, hours after its new InSight lander touched down. The image came after the rover had earlier sent back a somewhat blurry photo. The space agency said that in the interim the spacecraft had opened its solar panels, which allowed it to recharge its batteries for the mission. The InSight spacecraft landed on Mars on Monday after six-month journey to the planet. The dispatch that included the first clear photo of Mars from the mission were relayed to Earth by the Mars Odyssey orbiter. NASA has reached the asteroid and is now making preparations to orbit the body. The United States' first asteroid-sampling probe has arrived at its target, acing a deep-space rendezvous about 76 million miles (122 million kilometers) from Earth. NASA's OSIRIS-REx spacecraft sidled up to the diamond-shaped asteroid Bennu today (Dec. 3) at about 12 p.m. EST (1700 GMT), wrapping up a circuitous cosmic chase that lasted 27 months. "#WelcomeToBennu! After two years of travel — and more than a decade of planning and work by my team — I’m here. But Arrival is just the beginning…" team members wrote today via the mission's Twitter account, @OSIRISREx. OSIRIS-REx is now less than 12 miles (20 km) from Bennu, but the probe is flying along with the space rock rather than orbiting it. Orbital insertion won't come until Dec. 31, after OSIRIS-REx has performed a series of flybys that will bring the probe to within just 4.3 miles (7 km) or so of Bennu's boulder-strewn surface. During these close encounters, OSIRIS-REx will study Bennu in depth, allowing team members to nail down the 1,650-foot-wide (500 meters) asteroid's mass and precise shape. Blasting a hole in the surface? Nothing like shipping a cannon aboard your rover mission. A Japanese space probe Friday released a pair of exploring rovers towards an egg-shaped asteroid to collect mineral samples that may shed light on the origin of the solar system. 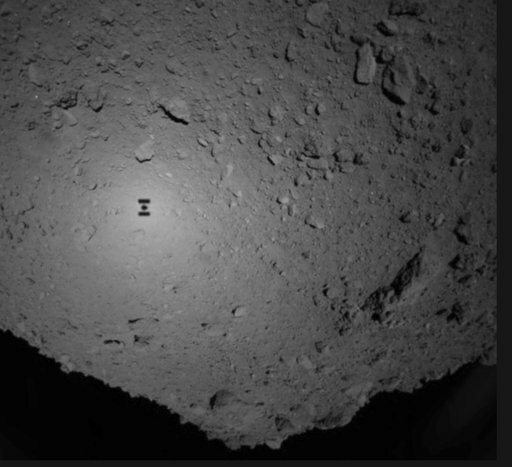 The "Hayabusa2" probe jettisoned the round, cookie tin-shaped robots toward the Ryugu astroid, according to the Japan Aerospace Exploration Agency (JAXA). If the mission is successful, the rovers will conduct the world's first moving, robotic observation of an asteroid surface. Taking advantage of the asteroid's low gravity, they will jump around on the surface—soaring as high as 15 metres (49 feet) and staying in the air for as long as 15 minutes—to survey the asteroid's physical features with cameras and sensors. So far so good, but JAXA must wait for the Hayabusa2 probe to send data from the rovers to Earth in a day or two to assess whether the release has been a success, officials said. "We are very much hopeful. We don't have confirmation yet, but we are very, very hopeful," Yuichi Tsuda, JAXA project manager, told reporters. "I am looking forward to seeing pictures. I want to see images of space as seen from the surface of the asteroid," he said. The cautious announcement came after a similar JAXA probe in 2005 released a rover which failed to reach its target asteroid. Next month, Hayabusa2 will deploy an "impactor" that will explode above the asteroid, shooting a two-kilo (four-pound) copper object into the surface to blast a crater a few metres in diameter.